The Church of Jesus Christ, despite all of its appalling failures and sins, is the greatest force on earth for good and the only threat to Satan's Kingdom. It is the only group of people on the planet feared by the god of this age. No other religion poses any threat to him. None. Just the Church. Satan trembles when he hears God's people praising their Lord. Even the weakest saint on his or her knees surely strikes fear in the enemy camp. 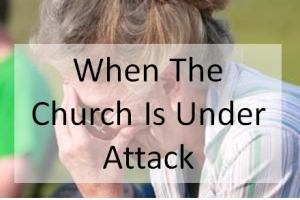 No surprise then that the Church is always under attack. This is especially true today as persecutions and unspeakable horrors are befalling many of our Christian brothers and sisters around the world. We see also the abominations of today's culture impacting our nations as a flood of evil threatens to overwhelm and marginalize the Church. Sadly, instead of influencing our culture for good, the Church finds itself being influenced by it. Such times call for us to identify the real enemy. It is not our leaders who disregard God's laws or those in the media or the politically correct brigade who mock us for our faith. Our fight is not against flesh and blood. No, our battle is with the powers of darkness that goad them to blaspheme the sacred and celebrate the obscene. As prayer warriors we must boldly rise up and take the fight to the heavenlies where the real battle is being waged. We have spiritual weapons to demolish strongholds of deception and every godless philosophy and false belief system that tries to exalt itself above the knowledge of God. (2 Cor 10:4-5) The Church, triumphant in Christ, must confront and destroy these if we are to see God's kingdom advance. And so we keep our eyes fixed on Jesus. As the days get darker may our worship grow ever stronger. The more the enemy attacks the more praise God will receive! And let us show God's love to those who rage against the Church and who want to silence it. (How they must fear the Truth!) This is no time to retreat but to step up our intercession for the persecuted church and for God to be glorified among the nations. His honor matters!